Coming up on their 25th anniversary, the iconic Blue Man Group celebrated their Luxor homecoming when they unveiled their all-new Blue Man Theater at the Egyptian-themed resort this morning. “We are all about connection,” explained Chris Wink, original co-founder of Blue Man Group. “We are all about creating kind of a euphoric connection [between the Blue Men and the audience] at the end. So here, I would say that the ultimate theater has alluded us… if I were to describe [the ultimate theater], it would be a phone booth that could hold 700 people or maybe a car…I think this is the closet we have ever come to the perfect setting. The 830-seat venue is ideal for optimal sound and attaining an intimate and “almost claustrophobic” closeness that allows the audience to pick up on every integral facial expression and body movement of the Blue Men. Audience members will experience the most immersive Blue Man Group show in the production’s history. With the core of the Blue Man Group experience boasting the outshining message of raw human interaction that can be traced back to the big bang, the goal of the new theater is to leave the audience members feeling as though the space itself is a fourth Blue Man. 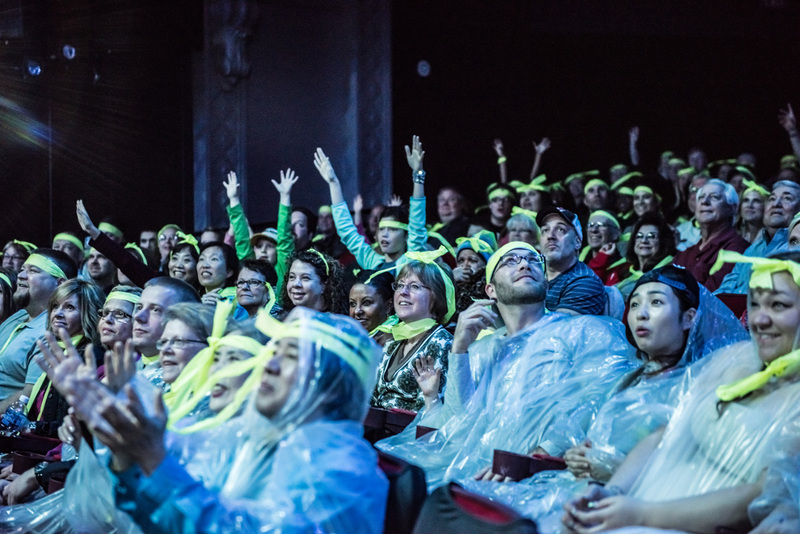 And even before ticketholders step foot into the theater, decorations attract onlookers and show goers alike with curiosity-inducing displays and luring art highlighting the childlike wonderment that embodies the essence of the Blue Man character. 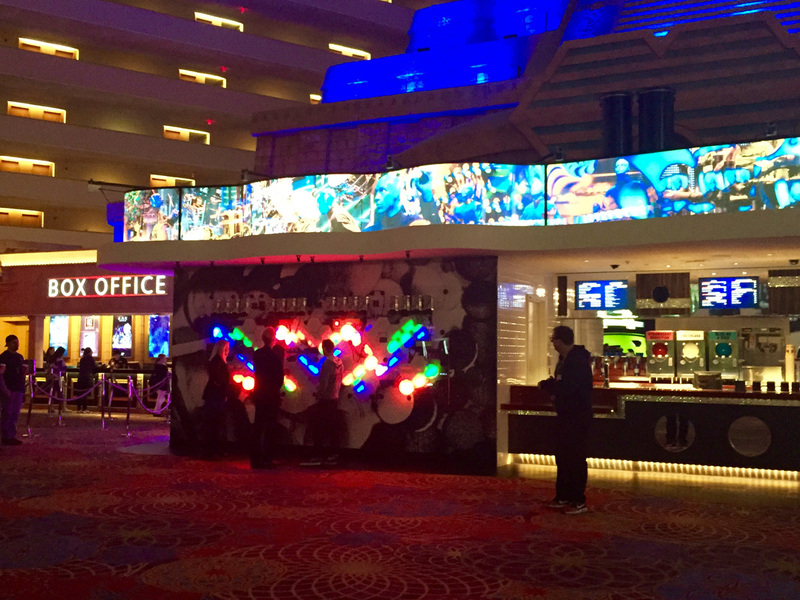 Aside from the illuminated Blue Man Group theater banner and the all-things Blue Man gift shop in the gathering space outside of the entrance, a one-of-a-kind interactive video installation covers a portion of the theater’s exterior. Interactive video installation… we dare you to push the big red button. 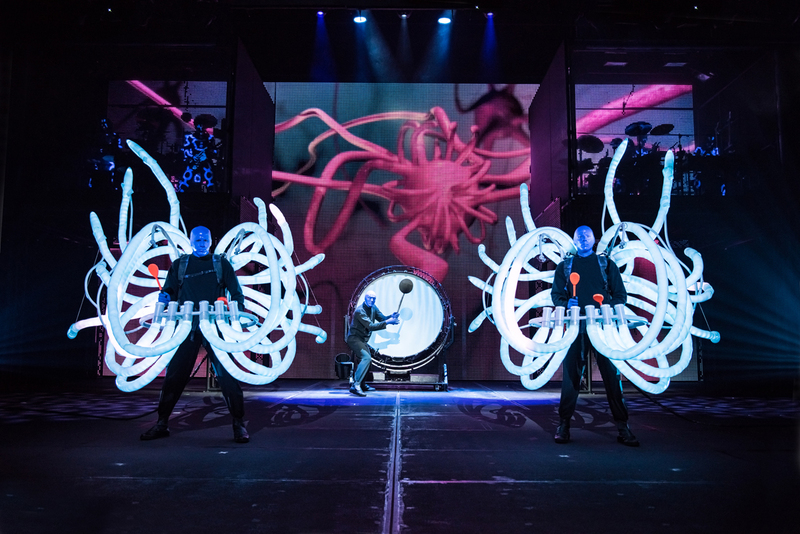 And with new experience additions such as the interactive wall overflowing into the production itself, Blue Man Group first-timers as well as patrons will get to experience some new instrumental acts in the show. Other changes that will be seen integrated into the Blue Man Group experience lie largely within the production’s instrumentation. “Subliminally, the Blue Men are interested in exploring that, no matter how technological things become, the desire to connect, the love of the live experience is still going to be there. It’s part of who we are — it’s part of our DNA,” Wink explained. “Nothing against Facebook or Twitter or whatever, but there’s a reason why live theater is stronger than ever. No one is talking about how live theater is going away and the internet is killing live experience. No one is saying that people aren’t going to sports and concerts and Vegas shows. What’s happening is that people are going to tons of them. So, that’s interesting that no matter how much these little portals into the internet transform our lives, [though] in many ways good, they still don’t replace the need for a heightened experience. 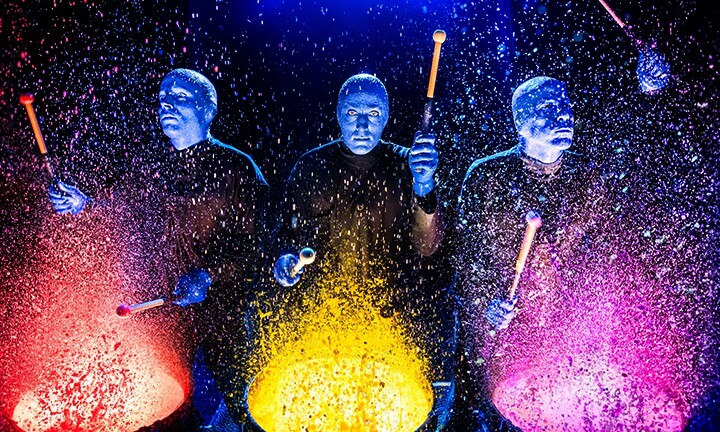 Having thrived in the Entertainment Capital of the World for nearly three decades as well as elsewhere across the globe, the “sensory overload” that is Blue Man Group is bigger and better yet more intimate. And while we foresee a bright and everlasting future ahead of this globally acclaimed troupe of performers, we currently want just want to rejoice their Luxor homecoming until we too, are blue in the face. Get your Blue Man Group tickets and see them perform in their new home at the Luxor seven nights per week.